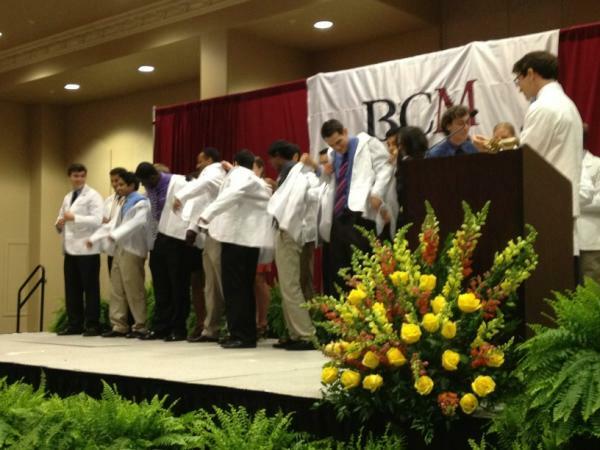 The White Coat Ceremony marks the beginning of the journey into medicine for first year medical students. In addition to the moment when second year students put the white coats on their new colleague, this night is also used to recognize role models. This year’s Ben and Margaret Love Foundation Bobby Alford Award for Academic Clinical Professionalism, given to the faculty who best demonstrated exemplary professionalism was awarded to Dr. Cynthia Peacock. We also ask both students and faculty to address the new class. The following is the speech given by Jenny Walsh, a 4th year student, to her new colleagues and their families. My dear new fellow students, I welcome you as friends and colleagues. Welcome to Baylor College of Medicine. Family and friends, welcome. Thank you for the essential support you give. Welcome to the fastest, most amazing, most enlightening, most discouraging, most invigorating, most exhausting, and most challenging years of your life so far. Welcome to a profession that hears and keeps the most intimate secrets, understands parts of the human body and human experience that most people will never know, and advises on some of the most profound decisions that people will ever make. We mark the beginning of this life-altering process with a ceremony, as a symbol to you that today everything changes. Today, jump in to this new life and learn to apply the mountains of seemingly arcane bits of knowledge you will be given. Dr. Kretzer will tell you about a tiny protein hanging on the outside of a platelet. It will look like an insignificant squiggle, but a mother’s body can create antibodies to this protein that can destroy her unborn child’s platelets, possibly leading to hemorrhage, devastating disability, or even death. That squiggle matters to somebody, as do thousands of other details that will bombard you. Learn them for your patients. Most of the changes you will make in the next four years will be imperceptible to you. You will wonder how you can possibly go to clinics as the MS2 neophyte that you are, until you talk to someone who somehow does not understand how vaccines work or what asthma is, how dialysis works, or why they don’t need antibiotics for a viral infection, and you will see that you have grown and that you already have something to offer. Then you’ll meet a patient who can recite the minutest details about Stevens-Johnson Syndrome, and you will recognize you still have much to learn. To family and friends, you have front row seats to the remarkable journey your loved one is taking. You may remember them learning how to talk and walk. Today, they are medical toddlers, learning thousands of new words, and how to walk in doctor shoes. Toddler years are tough. If they fall down, help them get back up. If they scream and cry—it’s probably because they feel tired and very small. Love them. They will make it, especially with your support. Right now, it feels like dress up, with a grown up Fischer-Price doctor kit—the crisp white coat, shiny new stethoscope, otoscope, reflex hammer, and a badge on a retractable badge clip. Wait until Thanksgiving dinner, when they regale you with stories of their cadaver. Or wait until third year when they’re quiet at gatherings, though they may mention during dessert that they performed much of a vasectomy. Don’t worry. It’s just a phase. A lot of their new experiences will have significant portions protected by HIPAA or will be inappropriate for mixed company especially while people are eating. They may be out of practice talking at all, as they’ve been studying 12 hours a day for a board exam. As you watch this process unfold, remember that your amazing student is now in a top tiered medical school, surrounded by equally amazing peers, facing a demanding curriculum. They belong here, but they may feel for possibly the first time in their life that they are not good enough. I assure you, they are good enough. Please reassure them in those inevitable dark moments of self-doubt that they are feeling how everyone else feels. It’s ok to feel intimidated, but they are here because all of us believe that they will make fantastic doctors. Now my dear fellow students, we give you a white coat as a passport, a mantle of responsibility, a signal to the world that you are here to learn and to serve. You may just be walking through a hospital, but someone will ask you where out-patient imaging is. On your first day in the ER, someone will tell you their drug history or that they have HIV simply because you asked. You may have never seen childbirth before, but someone will not only let you watch, they will let you catch their baby. During your first surgery, you may get to drive the camera in someone’s abdomen, or help stitch up the skin afterward. You may be the one who finally explains to a diabetic patient how uncontrolled blood sugar will harm their eyes, their nerves, and their blood vessels, and make it harder for their wounds to heal. You will be admitted to bedsides when patients are their most vulnerable. Your kind words, your gentle touch, your observations, your willingness to listen, your thoughtful questions, and your growing knowledge can make a difference to a patient, even as a student. Because of this access, which comes from the medical student role in which you are now entrusted, learn all you can. Deserve this trust. You can do it. We will help. Thank you. This entry was posted in Professionalism and tagged Ceremonies, White Coat Ceremony by marylbrandt. Bookmark the permalink.